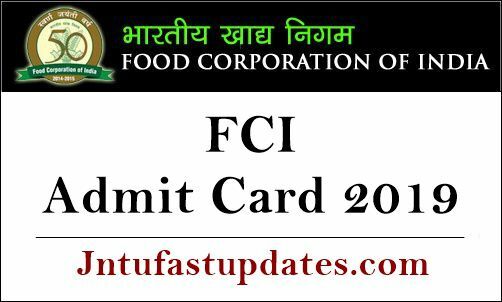 FCI Admit Card 2019: Food Corporation of India (FCI) is going to organize the written test for JE, Steno, Typist, and assistant posts. All the applicants can get ready for the written test round. As per the updates from the organization, the competition is tough for FCI jobs. Hence the competitors need to perform well in the written test round to get shortlisted for the next rounds of selection process. Before going to attend the written test round, aspirants applied for FCI JE and other posts must have to download the hall tickets. FCI Admit Card is the most important document to attend the examination. The exam invigilators will check the hall tickets of the candidates before allowing him/her to the examination. In case if any of the candidates fail to show the hall ticket at the time of verification, he/she will lose the opportunity to attend the exam. Hence the hopefuls must be mindful in carrying the hall tickets while going to the examination. FCI will release the hall tickets on its official website, fci.gov.in. Food Corporation of India (FCI) is the state government organization that monitors various works. The organization annually announces various recruitment notifications depending on the requirement. This year the FCI announced 4103 various posts hugely for various locations across India. FCI released the notification for posts for Northern region, Western region, Eastern region, Southern region, and North-eastern zone. Vacancies announced by the FCI are JE, Steno, Typist, and assistant. Interested and eligible aspirants sent their applications from 23rd February to 23rd March. Selection of candidates will be done through preliminary examination, mains examination, and interview rounds. Selected candidates will get a good pay scale and intensives as per norms. FCI will activate the admit card download link before 1 week to 10 days of the examination date. Hence the aspirants applied for various posts in FCI must have to wait till the admit card downloading date is announced. Soon the organization will announce the date on its portal, fci.gov.in. Candidates applied for the posts can keep checking the official website on a frequent basis to download the hall ticket. Hopefuls can check the details of the candidate’s information and exam center info from their admit cards. How to download FCI Exams Admit Card 2019 Online? Search the FCI JE, Steno Hall Ticket download link in organization website.